The ‘Icicle’ was a very appropriate name for the end of season laser event in Baltimore last weekend. Over 30 boats travelled from as far as Dublin to support this much loved event, which hadn’t taken place since 2011 due to adverse weather conditions. Saturday started wet, windy and cold but as the weather was set to worsen, 4 races were completed with the Royal Cork’s Nick Walsh, Johnny Durcan and Richard McGinley doing well. 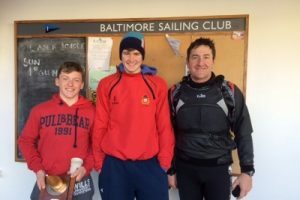 Sunday dawned sunny and sailable with Richard Thompson putting in a great performance in the 2 races of the day to finish the event 2nd overall for the Radials. 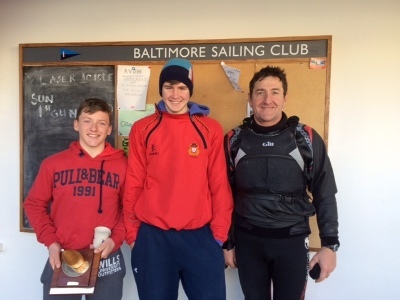 Nick claimed 3rd place for the Standard rigs (and 1st Master) and top honors in the 4.7s went to Johnny Durcan.